This picture is one of my favourites. Once we had finished our work at science camp we had to pack it all down and move off to base camp II on the northern coast of Nordskioldland. 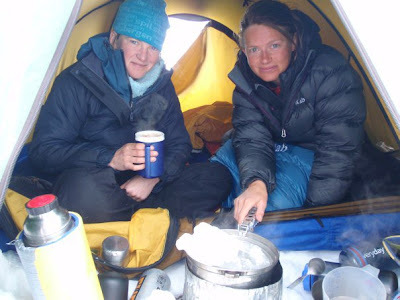 By this time, everyone on the expedition, except me, had been to the coast and spent time at base camp II, while I had been up at science camp. I had heard all about the birds and the ice bergs and the beluga whales and the walruses and how Spring had arrived, while up in the mountains there was very little wildlife, and it was still quite wintry. I hadn't minded at all, but I guess I had been getting excited at the prospect of seeing another area and doing more mountaineering and exploring. So it was with a very happy heart and slight holiday feeling that I woke up on this col, on our first morning away from science camp, on our way to the coast. This is Kath and I melting snow for our breakfast. Thanks to Steve for the picture.